When July arrives you can start to smell the new season. Football’s hibernation is coming to its latter stages, heart rate and breathing has increased, the snooze button’s been pressed, the twigs have been disturbed with a tentative sniff of the air. It dangles tantalisingly on the horizon. Most league’s fixtures are out, teams are back in training and the friendlies are starting soon. Going to a game this early though, is like opening a christmas present before christmas day – while it is exciting it feels wrong somehow. Watching football in early July is unnatural – like cauliflower cheese at a carvery. It’s become a bit of a tradition now, though, for a Welsh Euro tie to provide the amuse-bouche to the coming season. Despite the lack of goals they have to be my favourite fixtures. For the last two seasons I’d watched TNS. I had the choice this time of watching Cefn Druids against MyPa 47 (Finland) or Bangor City against Zimbru Chisinau (Moldova). It was an easy choice – despite it being Cefn Druids’ first ever European tie in their 143 year history they were playing at the promiscuous Racecourse Ground of Wrexham. 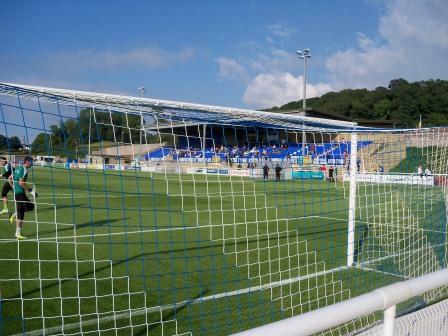 Far more tempting was Bangor’s first Euro tie in Bangor for 14 years and their first at the brand new Nantporth stadium. I find it strange that Cefn Druids’ game was by far the more popular choice for groundhoppers. Ordinarily a two hour plus drive on a week night would be way beyond the limits of what I’d consider sane. But the uniqueness of the tie, an opportunity to complete (again) the northern and mid Welsh Premier teams and the potential for a memorable and rare win for a Welsh team in Europe pushed the boundaries way beyond the norm. I used some flexi (footy) time and had a half day off work in order to enjoy a relaxed day out in Bangor. A condition of having a ticket reserved was getting there before 5pm. I got to Nantporth at about 4 to pick my ticket up. Once again Welsh football proves itself to be the most friendly and least bureaucratic in England and Wales (I would say the world but to be fair, with 3 exceptions, I’ve only ever been to English and Welsh games). Not only was my ticket there as advertised, I was welcomed to give myself a tour of the ground, the ‘concierge’ telling me to make the most of it before the European officials found out, with a wink. The ground lies off the Holyhead Road, in a rural setting, with the Menai straits just behind. 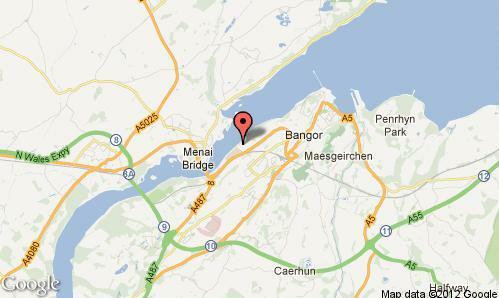 Bangor is a very pleasant little town, a sleepy university town with gulls’ cries providing the background music. On this Thursday afternoon it was sleepier than a junior doctor after a diazepam. I could almost hear it snoring. A pint in a beer garden in the July sun was a perfect preamble to the evening’s fixture. Nantporth is a quality new-build ground in a lush verdant setting. 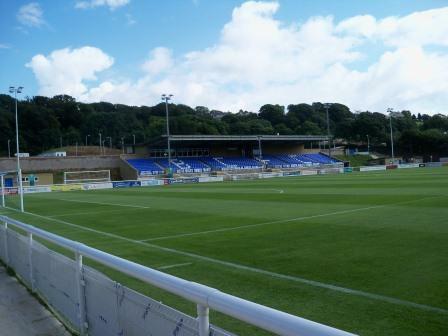 The main stand has around 800 seats and two much smaller stands sit on the other side taking the total seats to above the European match hosting requirement of 1,000. 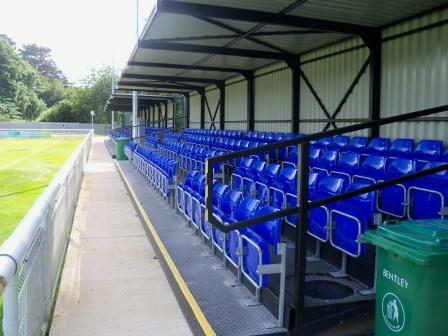 It’s not just your bargain generic stand, it is quite a substantial structure housing the clubhouse, ticket office and changing rooms. It exudes character. The other stands make up the seat numbers and are the drop and drag variety, but give the fan a choice of sides to sit on. From a few conversations, I’d gleaned that there was a tug of war going on between the pernickety Europa officials and the laissez-faire Welsh ones. A fellow groundhopper, Shifnal Shrew, tapped me on the shoulder at half time and sat in the main stand – in the first he’d been ‘moved on’ from standing position to standing position, like a vagrant, by the half-arsed Bangor stewards (as standing was prohibited for this game – Europa rules). 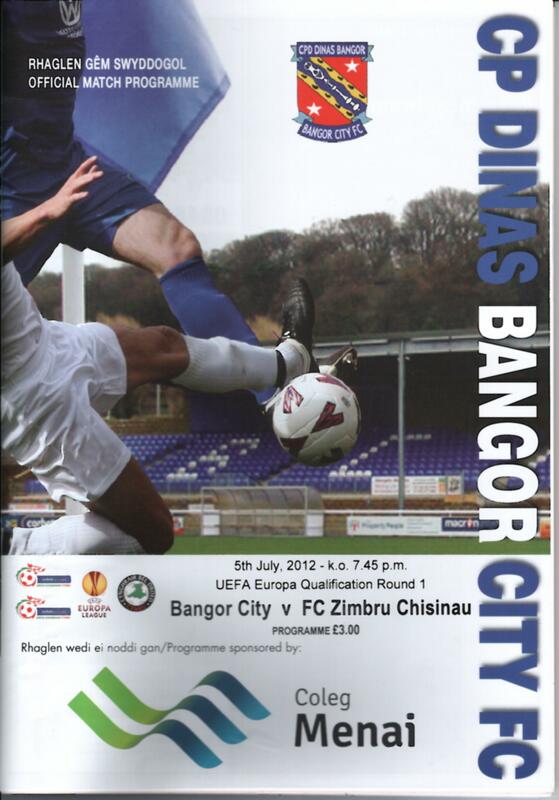 The game was ok for a 0-0, but quite disappointing from a Bangor perspective. 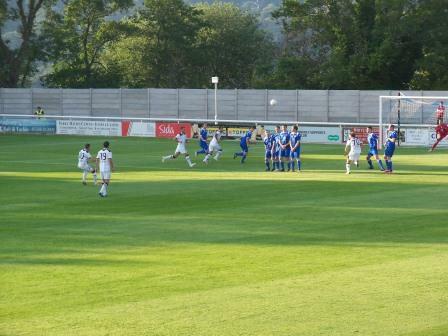 Bangor missed an absolute sitter after a few minutes, shooting over from eight yards. Zimbru’s defence was appalling to begin with, but after about ten minutes the first half settled into a rhythm of Zimbru possession and quality but with no finish. The second half was much the same, with Zimbru showing their superior quality without creating anything. Near the end Bangor missed a couple of chances that really should have gone in. It should have been their first home European win in more than half a century, but it wasn’t to be. A good effort nonetheless. 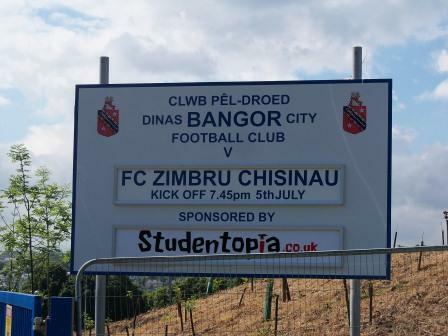 This entry was posted in Groundhopping, Travelog, Welsh football and tagged Bangor |City, CPD Bangor City, Europa Cup, Nantporth, Welsh football, Zimbru Chisinau. Bookmark the permalink.